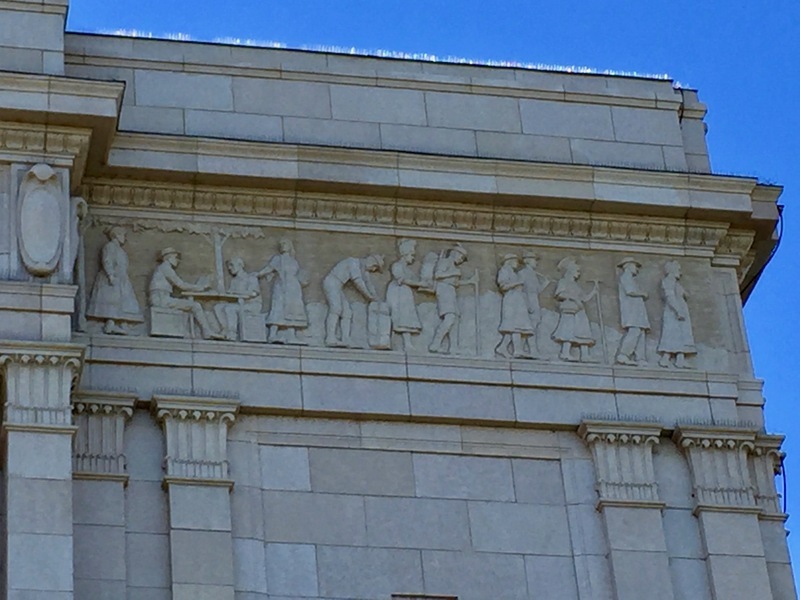 The Temple is decorated on its corners with frieze panels that depict Latter-day Saint beliefs about the gathering of Israel from the four corners of the earth as prophesied by Isaiah in the Old Testament of the Bible. A.B. Wright crafted the original design of scenes, and Torlief Knapphus sculpted models in plaster-of-Paris, which were then sent to the California Faience Company in Oakland, California, where the friezes were cast prior to their installation on the temple. Each panel is three feet, six inches tall, and sixteen feet wide. Begin on the East Corner of the North Side and walk counter-clockwise for a description of each panel. 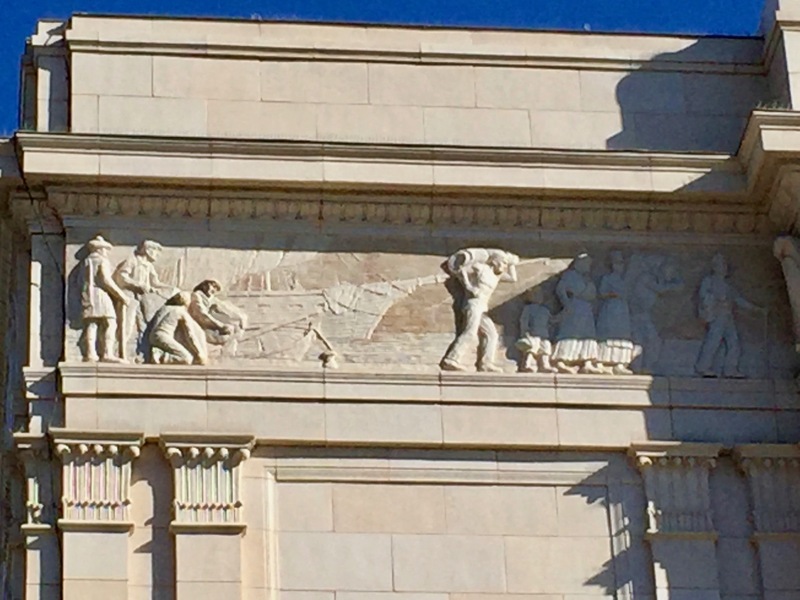 North side of the temple, east corner: This panel depicts Dutch and German Latter-day Saints entering their ship bound for America. Note the wooden shoes on the Dutch people and the windmill in the background. The German Saints are packing away bedding and entering the ship. 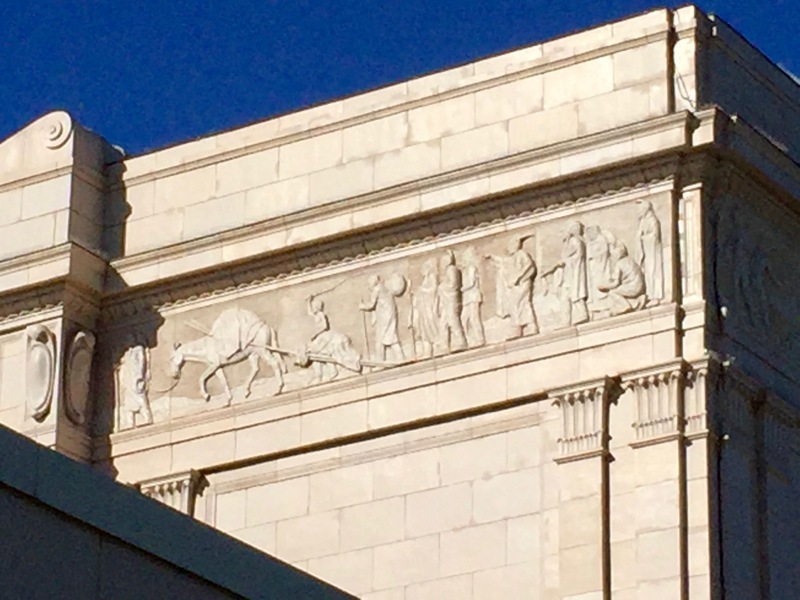 North side of the temple, west corner: Here the Mormon pioneers are depicted crossing the Great Plains and within sight of the Rocky Mountains, to Mormons fulfilling the prophesy found in Micah 4:1-2: "But in the last days it shall come to pass, that the mountain of the house of the Lord shall be established in the top of the mountains ... and many nations shall come ..."
West side of the temple, north corner: Depicted here is the landing of a ship in America that has carried Saints from the British Isles. The leader is English, followed by Welsh people in their traditional attire. On the boat Irish and Scottish pioneers are depicted. 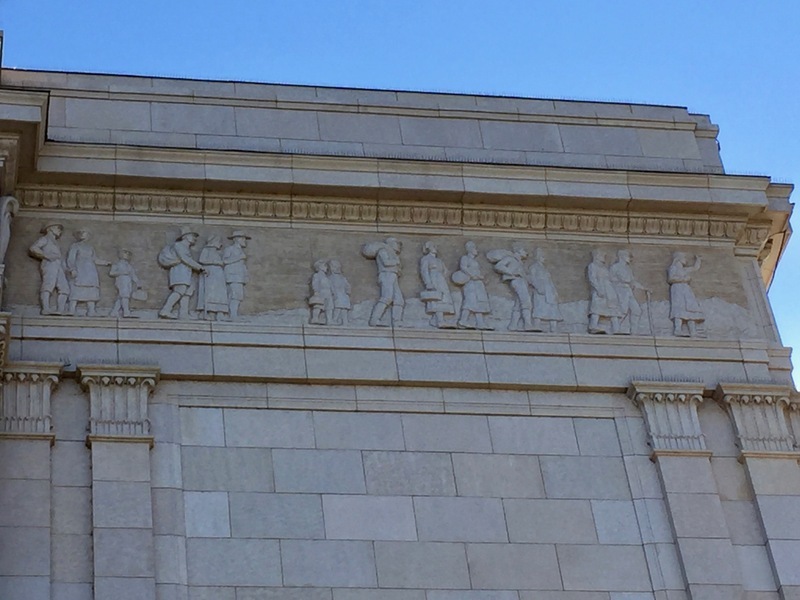 West side of the temple, south corner: This scene depicts the first parties of Saints who, in 1846, were driven from their homes in Nauvoo, IL and crossed the plains traveling the 1,400-mile journey from the Mississippi River to Salt Lake City. The couple pulling the handcart represents the approximately 4,000 Saints who used a handcart, rather than a traditional wagon pulled by oxen to carry their belongings to Salt Lake. 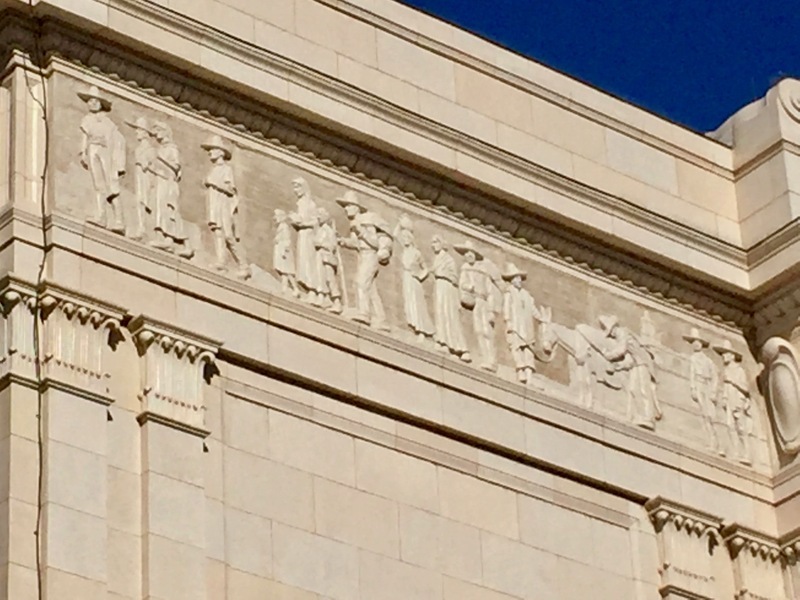 South side of the temple, west corner: This panel depicts the Hispanic people. They too are leaving their homes and gathering with the Saints. 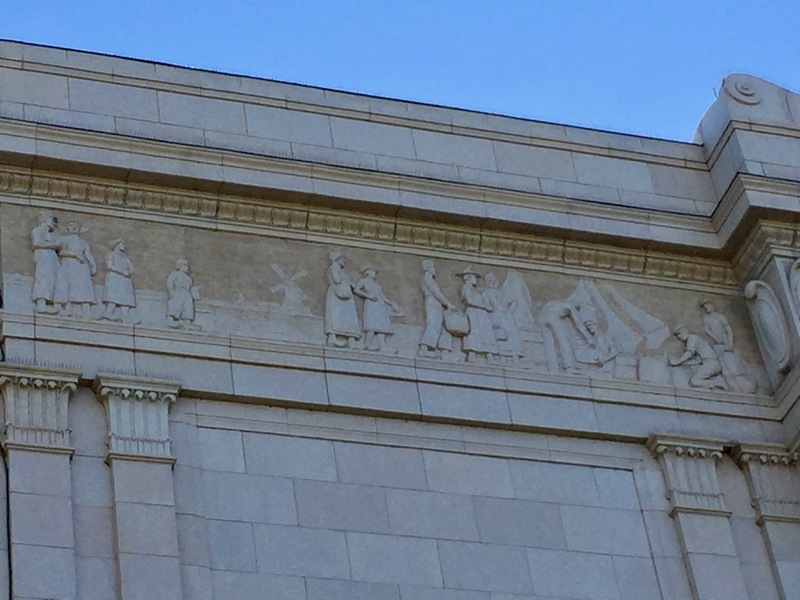 South side of the temple, east corner: This panel represents the Native American people traveling to unite with the Church. The scene depicts the chief leading his people. 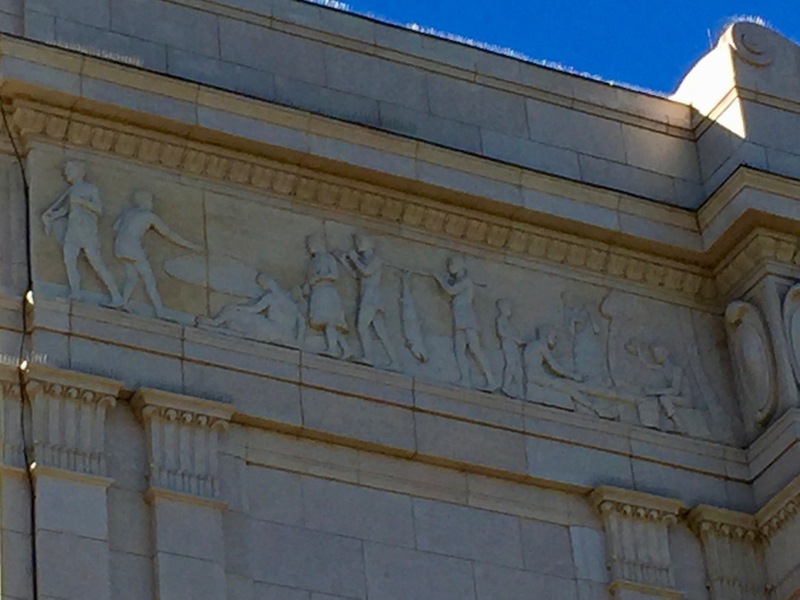 East side of the temple, south corner: This panel depicts Pacific Islanders (Hawaiians, and others). Note that this is the only panel in which the people are not traveling. While the temple in Mesa was under construction, a similar temple was being constructed in Laie, Oahu, Hawaii, enabling the Hawaiian Saints to gather there. 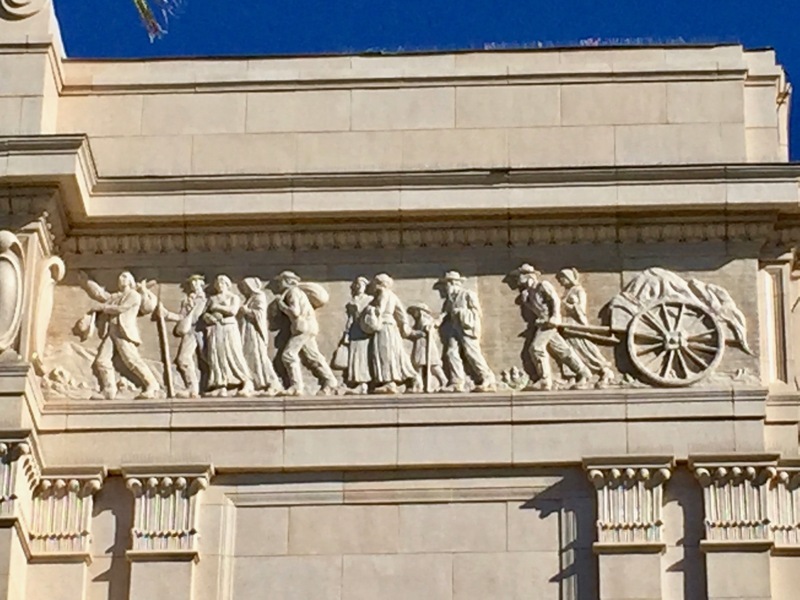 East side of the temple, north corner: Represented here are the Swiss and French people on their way to Holland where they will embark for America. Those in the rear are Italians. Notice the wife anxious to join the Saints in America, while the husband is unwilling to go. Some Saints, in addition to leaving their homes, also left family and friends to gather with the Saints. 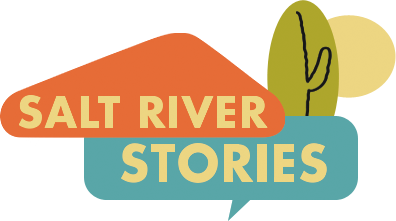 Stephen G. Williams, “Mesa Arizona Temple Friezes,” Salt River Stories, accessed April 18, 2019, https://saltriverstories.org/items/show/229. W. Bradford Perkinson, comp., The Ninth Temple: A Light in the Desert: Mesa, Arizona, 1927-2002: Seventy-Five Years (Orem, UT: Granite Publishing & Distribution, 2002), 140-143.